Stamp the background with the large Watercolor Wash. Tear the small strip of Crumb Cake to make ground. Tuck a moon, Early Espresso tree (not pictured) and strip of burlap ribbon beween the background and the torn panel. Inside stamp “thanks” and the crow. Color scarecrow with blender pen and ink. Adhere with Dimensional. Hint for using the Cookie Cutter Punch. 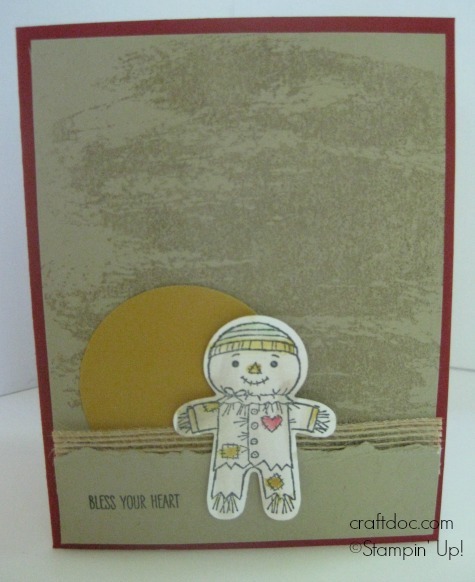 If you do not want the pieces on the sides to cut, use 5-1/2 by 2 inch strips to stamp on. Stamp the cookie-cutter so the “feet” are towards a short edge. You can get 2 from each strip. 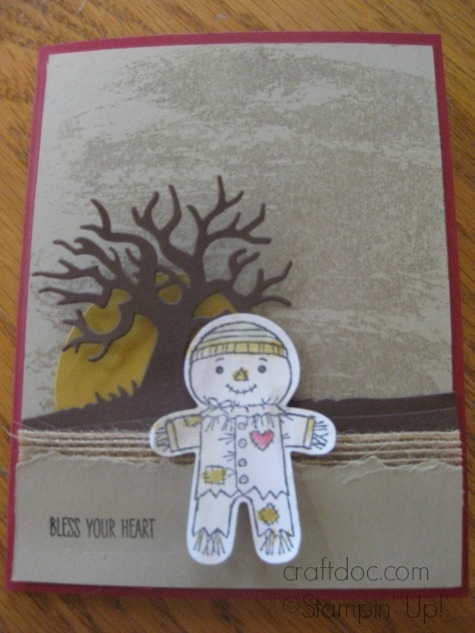 Here is the prototype for this card. Doesn’t the tree add just the finishing touch!